Joseph B. Richardson, Jr., Ph.D.
Dr. Joseph Richardson joined the Department of the African-American Studies at the University of Maryland-College Park as an Assistant Professor (Public Policy Tenure Track) in August 2006. 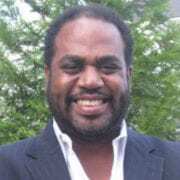 He is currently a Faculty Associate for the Center for Substance Abuse (CESAR). Dr. Richardson received his PhD and Master’s Degree from Rutgers University-School of Criminal Justice and his Bachelor’s Degree in African and African-American Studies from the University of Virginia. In 2003, he was awarded a two-year Spencer Foundation Post-Doctoral Research Fellowship at the University of Chicago. From 2005-2006, he served as Assistant Professor-Research Faculty for the Chapin Hall Center for Children at the University of Chicago. In 2005-2006, he was awarded a grant from the MacArthur Foundation’s Transitions to Adulthood Network to study the social context of juvenile re-entry in Chicago. In 2008, Dr. Richardson was awarded a three-year clinical scholars’ research training fellowship in Mental Health and Substance Abuse in Corrections (MHSAC) at the University of North Carolina-School of Medicine and the Morehouse School of Medicine R25 Award. This research training program supported by the National Institute of Mental Health provides intensive public health research training in biostatistics and epidemiology to emerging junior faculty scholars of color with research interests in mental health, substance abuse, HIV/AIDS and chronic infectious diseases among correctional populations. In 2009, Dr. Richardson was selected as an Early Career Scholar for The Ford Foundation’s Scholars Network on Masculinity and the Well-Being of African-American Men. As an early career scholar, Dr. Richardson was selected by a cadre of nationally recognized mid-career scholars who have produced and disseminated major work on African-American men. As a member of this network, he is critically engaged in providing scholarly research and leadership in re-orienting public awareness and comprehension of the situation of African-American men, such that the range of issues and concerns pertaining to this constituency (e.g., fatherhood, employment, educational attainment, incarceration and physical health and well-being) is considered in an integrated and mutually reinforcing way. The network is also critically engaged in influencing social policy formation and shifting public conversation in academia, foundation circles and domestic policy think tanks as well as altering the journalistic focus on the cultural dimensions and conditions of African-American men. Dr. Richardson primarily utilizes longitudinal ethnographic data collection and analysis in his research studies. Dr. Richardson’s current research agenda focuses on the intersection of violence, mental health, substance abuse and HIV/AIDS among correctional populations, particularly young African-American males. His research agenda also explores parenting strategies for young African-American men living in high risk neighborhoods. In April 2009, as a junior faculty member, Dr. Richardson was awarded by the President’s Commission on Ethnic Minority Issues at the University of Maryland the Ethnic Minority Achievement Award for Outstanding Faculty Member. https://friendsresearch.org/wp-content/uploads/2017/09/richardson_joe-e1514131245446.jpg 271 271 awp-admin /wp-content/uploads/2017/11/fri-banner-logo-2.jpg awp-admin2017-09-28 14:30:142018-01-22 16:38:18Joseph B. Richardson, Jr., Ph.D.
James A. Peterson Tiffany Duren, M.S.